There are dozens of children's church bulletins about Good Friday out there. 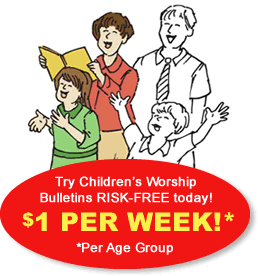 Why choose Children's Worship Bulletins? Choose one of our children's church bulletins about Good Friday because each is rooted in Scripture. Each teaches basic Scripture knowledge, not doctrine. You can trust Children's Worship Bulletins for biblical content. Other children's church bulletins may cover topics like Good Friday, Easter, Christmas and Pentecost, but Children's Worship Bulletins cover hundreds of topics, including church holidays and weekly lectionary readings. Find bulletins by Scripture passage, topic keyword or lectionary. You can trust that Children's Worship Bulletins will have a bulletin relevant to Good Friday, your lesson next week and all your lessons after that. Children's church bulletins that are specifically designed to be completely customizable with your church's name, contact information and logo. And the customization of Children's Worship Bulletins is quick and easy. When you're done, simply print as many copies as you need — in color or black and white. But the flexibility of Children's Worship Bulletins doesn't end there, your educational staff can use our bulletins to create imaginative and fun classroom activities that will engage even the youngest child. In this short article, we'll show you how to use our children's church bulletins about Good Friday to create activities for ages 3-12. Give everyone a bulletin packet and pencil. Explain the activity, "Today, we're going to learn about Jesus' arrest. First, we'll work to solve the puzzles in your bulletin. Then, once you've finished solving the puzzles, we'll retell the story about Jesus' arrest in our own words, by using the puzzles to help us remember the important details. Listen very carefully while I read the Scripture." Read aloud John 18:1-27 while the children listen. Continue asking the children about each panel in the bulletin, prompting them when necessary to remember important details from the Scripture. Divide the children into four teams. Explain the activity, "Today, we'll learn about Jesus' arrest. Then, we'll see which team can complete their puzzle first." Read aloud or have a volunteer read aloud John 18:1-27. Divide the class into teams according to the class size; four groups of three, etc. Give each team a bulletin packet and a pencil. Assign one of the bulletin's panels to each team. Continue, "Now, choose a teammate to record the puzzle answers. You may start working together to solve the puzzle when I yell, 'GO!'" When each team has chosen someone to record their puzzle answers, yell, "GO!" and wait for the first team to finish its assigned panel. Have the winning team read aloud their puzzle answers to check their work. Give small prizes to the winning team. Have the other teams read aloud their puzzle answers. Give each child a bulletin packet to take home.